...for the first time in more than a decade. An MSS sensor first flew on Landsat 1 in 1972 and was aboard each of the Landsats 1-5. 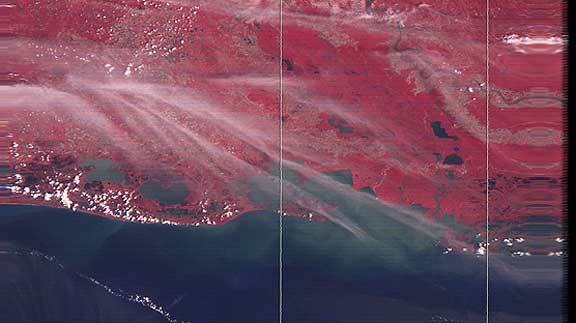 The MSS was powered down on Landsat 5 in the late 1990's, but the USGS recently turned on the MSS to determine the current state of the sensor. The USGS successfully downlinked raw data from the MSS for several successful passes in the past two weeks. Due to the length of its inactivity, much analysis and testing still lie ahead to determine the quality of the data, and the ability of the USGS to collect, process, and distribute the data. Therefore, MSS data distribution is by no means a certainty. Landsat MSS data acquired April 2012, courtesy of USGS.